Boroline is one such brand with which I have grown up because there is no time in life when I have not seen this product at my home. Like me, we can find millions of people in India who have great associations with this brand from past 84 years. Journey of Boroline as an Indian brand started back in 1929 when it was launched by the Gourmohon Dutta of GD Pharmaceutical as an answer to British products. Started at a low scale, soon Boroline cream found its place in every Indian home and even today, it is one of the most trusted brand in India. Boroline cream has become a legacy where parents pass on this cream to their children. Boroline is most used and favorite cream of our family thanks to my father’s great trust on this cream. It is common to find 4-5 green color boroline tubes at different parts of our home. I am also following footsteps of my father and using boroline regularly. I am not only using boroline because it is the choice of my father; however, I am using it because I found it very useful at numbers of times. The Boroline antiseptic cream has passed this long journey with success. The major reasons of success of Boroline as cream of India are its very low price and great usefulness. 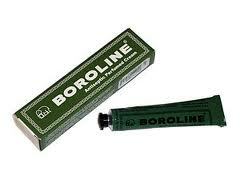 For many years, the cost of Boroline cream was less than 10 Rs; though, now company has raised its price to 24 Rs. A few years back, Boroline started disappearing from the market and it become very difficult to buy it. At that time, it looked that Boroline cream may disappear from the market. However, GD pharmaceutical came up with new design of boroline green tube, active marketing and price increase. These steps again put Boroline back in its top position. Today, boroline cream can be bought from any local store in India. Rebranding has helped boroline in gaining new customers too. The main ingredients of Boroline are Boric acid, Zinc oxide, wax etc. You can use Boroline to treat Cracked Lips, cure minor wounds and cuts, cracked heels, nail cuticles, dry and chapped skin and in many general skin infections. Parent company of Boroline says that it reflects the trust of generations of consumers and it is a great truth. Today, we find new and improved version of Boroline in a market which is less hard than its earlier version and provide quick relief. Overall, boroline is a good product at a reasonable price which delivers what it says. I will like to give it 10 out 10 marks for being an exceptionally good product and 100% Indian brand.